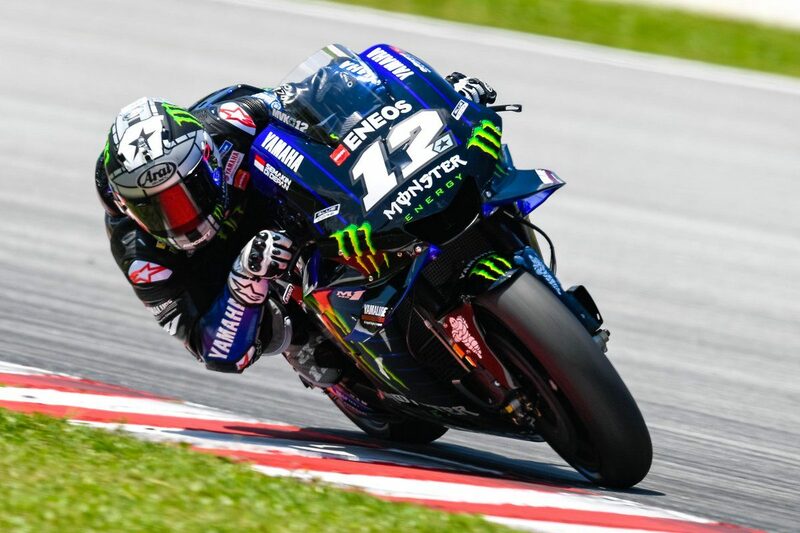 More than half a second separated Monster Yamaha’s Maverick Viñales from the rest of the field on Day 2 of the Sepang pre-season MotoGP test, while Jack Miller was third-fastest. Viñales’ fastest lap of 1:58.897s came very late in the afternoon, knocking Suzuki Ecstar’s Alex Rins off top spot by 0.527s. Rins’ personal best also came in the latter stages of the eight-hour session when he dislodged Mission Winnow Ducati’s Andrea Dovizioso from first position. Miller was also among the late flurry on his Pramac Ducati and lapped within a tenth of Rins but 0.620s away from Viñales’ benchmark. Dovizioso had been the first rider to better the fastest lap of Day 1, a 1:59.621s set by Marc Marquez, but was shuffled back to fourth by day’s end. LCR’s Cal Crutchlow, two days back from injury, was fastest Honda rider on Day 2 in fifth despite a crash, after which he was reportedly okay. Valentino Rossi (Monster Yamaha) was sixth and Tito Rabat (Avintia Ducati) seventh, while Marquez was eighth on his Repsol Honda with another relatively light load of 37 laps after off-season shoulder surgery. Danilo Petrucci (Mission Winnow Ducati) and Takaaki Nakagami (LCR Honda) rounded out the top 10, with Johann Zarco 11th on his Red Bull KTM Factory bike. Zarco’s team-mate Pol Espargaro was largely unscathed despite a tumble at Turn 1 and took 17th. Aleix Espargaro led the way for Gresini Aprilia in 13th position after an early race simulation.